Nature and culture go hand-in-hand on this journey. Delicious cafés, world famous tapas, staggering mountains, this trip has it all! From the aristocratic Basque region to rural Galicia, you will note great cultural variations along this lush coast. Stays include charming mountain towns and coastal resort atmospheres. Spend each night in Spain's renowned Parador hotels: state-owned castles and manors converted to luxury hotels. Discover the Green Coast's pristine beaches and delectable cuisine that make it the place to visit in Spain. Before departure, travelers will receive a comprehensive guidebook with restaurant suggestions, special sites of interest, maps, and tips — all at your fingertips in the Spain is More guidebook. This vacation provides a unique way to appreciate this beautiful coastal stretch with luxury hotels at reasonable rates. The Green Coast is a symbolic name for parts of the Eastern Basque country heading west along the coastline to western Galicia. Discover a region which is markedly different from southern Spain. It is distinguished for its culture, gastronomy, traditions and nature, covering everything from some of Spain’s most pristine beaches to high mountains and thriving towns. The first stop is close to one of the Northern Coast’s most visited and famous beaches. Nearby are many intriguing towns, all worth a visit. There are also several superb natural parks, a fun contrast after a few days visiting cities. Santander and Bilbao with the Guggenheim Museum are other remarkable places to visit. The next stop is in the westpart of Cantabria. Santillana del Mar is a wonderful small town with historic streets, palaces and mansions. The picturesque town also has several museums, such as Arte Religioso Regina Coelli, which you can visit. Nearby are the famous Altamira caves with prehistoric paintings. Visit the museum and the Neo-cueva, a replica of the caves. 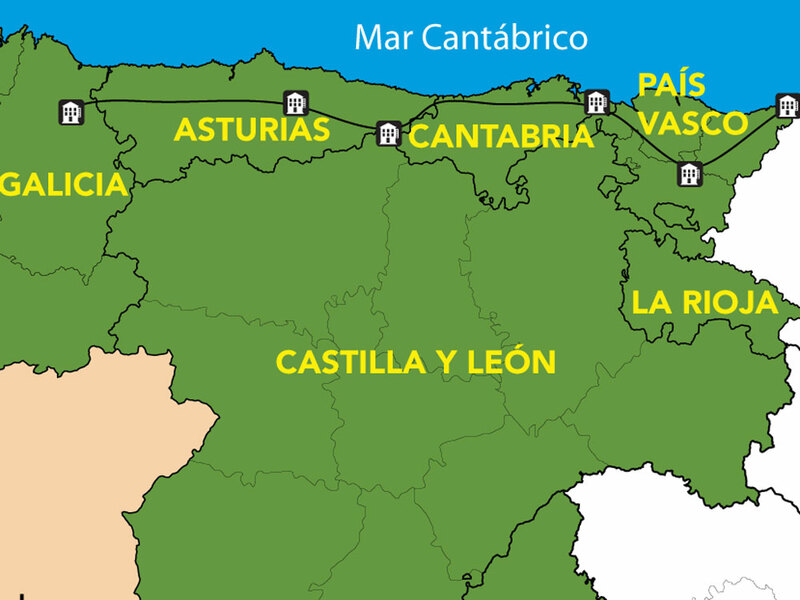 From here you can also visit Santander and the Cabárceno Natural Park. In this charming Asturian mountain village travelers can enjoy the famous Roman bridge and a few miles away lies the sacred lakes of Covadonga, the source of important Asturian legends and history. Gijón is a city that has plenty to offer and the city is one of the most beautiful and vibrant along the Northern Coast. Lots of great restaurants, shopping and exciting tours make the city an interesting tourist town. If weather permits, the beach and along the beautiful promenade are always exciting places to be. The old town is beautiful and well maintained, and in the evenings you will find everyone pouring sidra from green bottles. You will be leaving Asturias and saying hello to Galicia. Its a wonderful drive along the coast; here you'll find some of Spain's most beautiful fishingvillages and hidden beaches. In Ribadeo, you are very close to one of the world's most beautiful beaches, Playa de las Catedrales. A 15th century fortress provides accommodations along the distinctive and rugged Rias Altas coast of Galicia. Before you get to the hotel, pass by one of northern Spain’s most photographed and pristine beaches. Its hot springs give the many local spa hotels fertile soil and rivers have carved special landscapes over the past. See hotel. Sightseeing in Bilbao: Guggenheim Museum (included in price) and the old town. Accommodations: Elegant and central three-star hotel. Bilbao is one of the main towns in the Basque Country. Compared to the aristocratic San Sebastian, Bilbao has always been regarded as the ugly, industrial sister. This changed when Bilbao was chosen as home for the magnificent, futuristic Guggenheim museum. A visit to Bilbao is a visit to a modern Spanish city, combined with the charm of Spain’s old, evocative streets. The Spain is More guidebook will guide you through its best sites. 8 x nights including breakfast in 6 amazing Parador hotels. All departures are on Sunday. Order of hotels not changeable at this price. Optional: Extended stays. Transportation to starting point and from arrival point to anywehre in the world. Please ask us, we will be happy to assist you.